A few weeks back I had to buy a new pair of sneakers. While running on the treadmill, the sole of one of my approximately 14-year old sneakers came right off. It had been flapping a while near the heel but I didn’t realize it was going to actually come undone while I was running. The fact that I haven’t bought a pair of sneakers in more than a dozen years somehow provides considerable insight into my personality: I’m not one to throw away something old if it still works. Still recalling the confusion which I faced during my last sneaker purchase all those years ago, I went to the sporting goods section of the Central Chidlom department store and waded through the hundreds of shoes. Of course none of the employees took the initiative to offer help and even if they had, I’m not sure any of them are particularly knowledgable about shoes. I figured cross-trainers are a good choice because I use them for biking, walking and, recently, running. Focusing on the models labeled as cross-trainers (without knowing if those labels were accurate! ), I eventually selected three models and called over a clerk to bring the right sizes for me to try. I settled on this pair of Adidas shoes that seemed lightweight and breathable, features that are useful here in Thailand. Except for the fact that I had to buy one size larger than is ideal – I have wide feet, so have to suffer a little too much toe room in order to avoid a squeeze – these shoes have worked out pretty well. They are comfortable and, being dark, I don’t have to worry as much about scuffing them. I’d better mark my calendar for sometime around – let’s do the math – 2023 or so to buy my next pair. This entry was posted in Uncategorized and tagged Shoes, shopping by christao408. Bookmark the permalink. Boy you do keep your shoes for awhile! Oh thanks for reminding me, I need to buy some new shoes. Haven’t bought any in over a year and a half. Congrats on the new shoes! I went through my garage and actually found several pairs I forgot I even had. I am going to be good and simply wear out all my shoes…so I’ll probably not have to buy shoes until you do too. :o) Shoe shopping together in 2023? I think so! Either those were exceptionally well made shoes or you weren’t hard on them. Hope there was no damage or injury when you had the blow-out on the tread mill! Hey Chris, if you’re going to start running on the treadmill more often, I suggest you not wear your present pair of shoes for as long as you did the old ones. Like what arenadi mentioned, you will be causing too much stress on your joints if you run with worn out shoes. I’m particular about it now (i never used to be) since Chris started marathon running. He realized the importance of replacing his running shoes, no matter how unworn they look on the outside, after he has reached the recommend number of miles it is supposed to be used for. You may not notice it right away, but if you start replacing your shoes the moment you know its reached its mileage, you’ll do wonders for your joints, back and what ever parts of your body it impacts. And I think this is important since you seem to walk alot! And all the more now that you’ve started running. =) Do I sound like your mom? Haha~nice you picked out a good pair. I realize that there are dozens of sports stores all over the malls in Krungthep, you can spend weeks or days shopping for a pair of sneakers. You used a pair of sneakers for 14 years or so? That’s kinda crazy! 14 years for a pair of sneakers? wow, you are almost as bad as I was with my swimming trunk. Your sole came off on the treadmill is less dramatic than me losing my trunk in the middle of a swim, hehe. OK Chris – come on be honest, Lol, just how often did you wear those trainers !? I latched on to the ‘just recently running’ bit and figure this must be what has stopped you being able to keep your old ones for another 10 years or so. The shock is what finished them off ! LolSeriously though – 14yrs ! I can’t get shoes to last 14 months sometimes if I’m wearing them on a regular basis. Love your new ones – very smart. 14 years ? wow, I can’t recall own anything that long … (I really paused and think). One of my co-worker once told me, don’t be stingy when comes to buy shoes especially when you use it for running. A good shoes will save your joint when you grow older. @arenadi – I would have to ask my mother whether I went barefoot a lot as a child. Perhaps so. @arrian_strider – @vsan79 – @Chatamanda – @stevew918 – @Dezinerdreams – @tehls – @murisopsis – @yang1815 -Given the number of incredulous responses, let me clarify that there weren’t heavy usage shoes, although they probably should have been replaced a few years ago. @stevew918 – Did that really happen? @CurryPuffy – And they are all owned by the same company, I think – Central Group. And none of the employees know anything about shoes! @murisopsis – Thankfully, no. I realized quickly what was happening and hit the stop button. @tehls – Yes, mom. @kenpcho – It’s a date. @ZSA_MD – Yes, I actually thought of your fridge when I started writing this entry. @Roadlesstaken – Nobody gave you a pair for your birthday?! Even if your shoes might be an extreme example, if we were a bit more frugal, we probably would not be owe as much money to foreign countries all over. @christao408 – I have to replace my tennis shoes every two years because they wear out with at least once a week of playing. I do have lots of shoes though >_< I need to stop buying shoes. Oh my! 14 years for the lifespan of a sneaker??? I am way too hard on my shoes to have any of them last that long! I have wide feet, too. I usually buy a half size bigger to 11, and everything works out well except when I am going downhill.The feet would slide forward and the toes would jam towards the front of the shoes and hurt my feel when I go hiking downhill. BTW … I have your same issue with my feet which are wider than the standard D width. If I buy standard D width shoes I have to buy 10.5, whereas if I buy E width I can buy a 10 or in a rare instance I find a EEE, I can even wear 9.5 shoes.I’ve also learned to be really picky and buy really soft shoes for work (Bally has some excellent ones) as even 10.5 D shoes fit a bit too tightly and otherwise my feet would hurt. @TheLatinObserver – All this time I thought I was alone! I think we all went barefoot during the summer when you and your sister were growing up, except Dad. I’m not certain that caused the spreading foot, however. I expect that is heredity.I do agree with the comments about changing shoes more often, especially if you’re running. My suggestion is to use your running shoes only for the running, then when they need replacing, use them for the walking/biking activities and purchase new shoes for running. There is still “life” in the running shoes, but for less stressful activity. @Wangium – Welcome to the Wide Feet Survivor Club! I think I can speak for your feet and say “Thank you”. Hehehehe, I need to buy myself some new tennis shoes too. For some reason I don’t like dark tennis shoes – I always get white ones with some sort of design on it. nice. the next time you’re looking for shoes to fit your wide feet, try New Balance. i too have wide feet and i know how tough it is to find shoes that actually fit just right. @TheLatinObserver – @Wangium – That’s it, we’re forming a support group! @jandsschultz – There’s a shop in SF that sells shoes that are lower profile and supposed to be good for biking and general walking. I may pick up a pair or two while there and save these shoes for my walking/running. @christao408 – Haha and Sugi too. @rudyhou – Oh, thanks for that suggestion. I’ll have to see if the stores here carry NB. (Although I would imagine the shoes are made here or somewhere nearby! )@LADYLILYTHAO – And, interestingly, I get the dark ones because I don’t like my white shoes looking all scuffed. Hahaha, goodnes gracious, 14 years?I tend to tear through shoes pretty quick, giving them a life of about 2-3 years, but daaayumm, you keep yours for a long time for sure! Is that a pair that you wore every day? oh no, you are running in 14 year old shoes!? that is a good way to injure yourself. as a runner, i must protest! i also protest the choice of cross-trainers… my coach used to tell us that they weren’t good for any sport, but in particular they really do not make good running shoes. you should invest in a good pair of running shoes, and should replace them every 300-500 miles (i turn my old running shoes into my current walking-around shoes, and then those shoes get donated somewhere). it’s really important to replace your running shoes before the cushioning wears out, otherwise you will put too much stress on your legs or you may end up running with bad form (especially with shoes designed to correct bad problems like pronation), which will eventually lead to a lot of problems and physical therapy…. and i speak from experience! 14 years? No no oh no… oh mon Dieu! Even the best running shoes / cross trainers don’t last that long. The cushioning will have worn out. You must have strong legs otherwise you would notice some pain in the knee or back. I have to wear wide shoes (New Balance has a good selection) and orthotics as well. @Wangium – size 11 shoes? Man… that’s big. 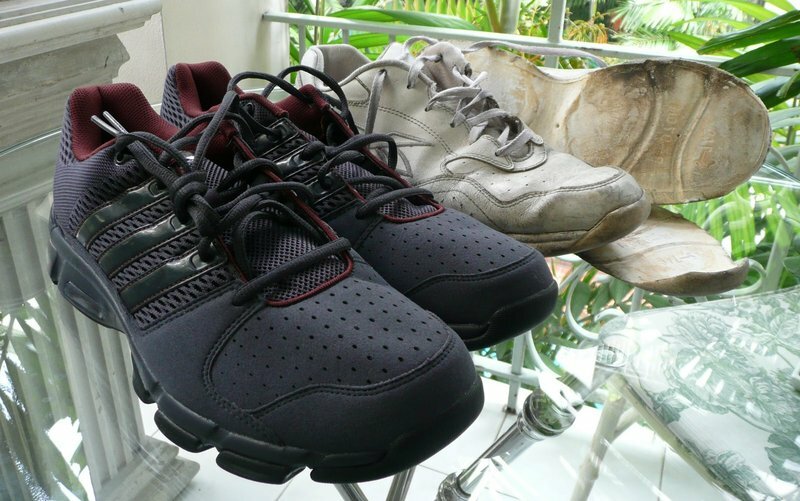 @ElusiveWords – New balance is still too slim for me.I need Skechers.Size 11 is just ok. Most people I know that are my height are about my shoe size. @Wangium – you must be taller than I had originally thought. @ElusiveWords – How tall did you think I was? @Wangium – @ElusiveWords – He originally thought you were about 8′ tall and had a long ponytail you could plug into your horse’s ear, but then he realized that he was confusing “Avatar” with “Xanga”. Ha ha… d’oh! @Wangium – uhm… about 5’10”. @ElusiveWords – Close enough. I am 6′.But most of my friends who are 5’10” have the same size of shoes as I do.How tall are you? @ElusiveWords – Probably? Has anything changed?